"Calling all Local Elementary and Middle Schools"
Be the Next to receive a Free Tennis Program! In 2006, the LTPA embarked on a venture to ensure that the game of tennis was introduced to area students in the hope that they would become players and develop a love for the game. Several schools were offered an after school session of tennis instruction. Most accepted our offer! The LTPA, a non-profit organization, goes into the school, supplies the equipment, instructors and time, using a game approach to spark interest. This fun focused program teaches kids the basics of tennis while promoting sportsmanship, camaraderie and friendly competition. At present, the LTPA has worked with over 15 schools in Lynchburg City, Bedford, Campbell and Amherst Counties. 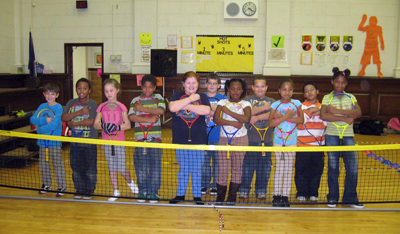 With grants from the United States Tennis Association and Virginia Tennis, the LTPA has been able to help many of these schools to receive equipment to keep the programs in both their after school programming and their PE curriculum. If you would like more information on how to bring this healthy for life sport to your school, please contact the LTPA program coordinator- Jen D'Orio at dorio4@comcast.net.